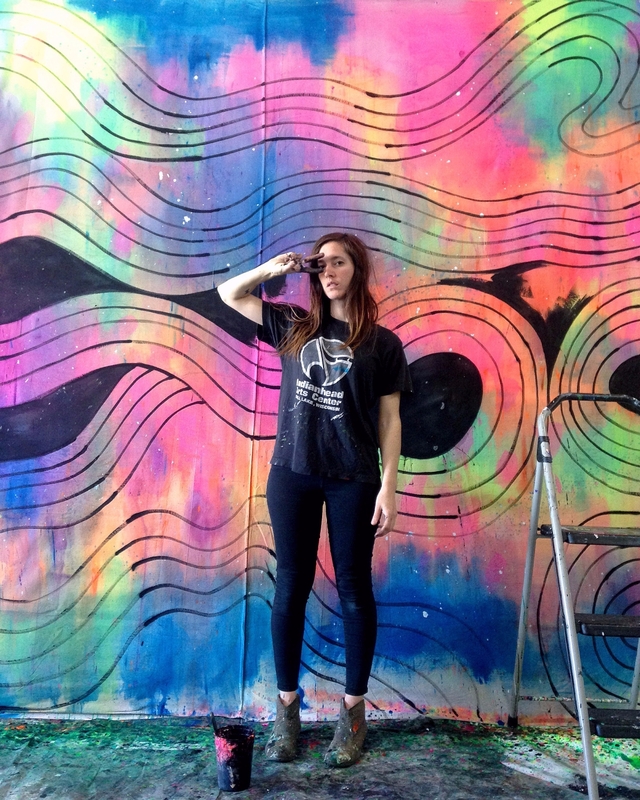 KRISTINA ROLANDER is a Milwaukee-based installation artist, creating large-scale paintings and immersive environments, often collaborating with venues, musicians, and festivals on custom stage design for live performance. With diorama-inspired structures, hanging elements, and handpainted backdrops, she transforms ordinary space by uniting art, audience, and performer in a singular, transcendent experience. For the 2017 Eaux Claires Music & Art Festival, Kristina was selected to create an immersive, outdoor stage design for The Creek upon which Justin Vernon (Bon Iver), Aaron Dessner (The National), and Francis and the Lights all performed. In 2018, she was commissioned to create the stage design for Andrea Gibson's Hey Galaxy tour. Other notable collaborations include backdrops for Little Scream, Shannon and the Clams, Ric Wilson, and WebsterX. In the Milwaukee area? You can see her installation "Op Art Psychedelia" currently hanging at Cactus Club. Want to see more? Catch her various backdrops in rotation at Company Brewing. Follow along on Instagram to stay up-to-date on recent projects.